This Memorial Day, to kick off our summer season of traveling, we visited the White Mountains of New Hampshire to go to Story Land during their opening weekend. We stayed across the Kancamagus Highway at the newly-renovated Mountain Club at Loon, a true four-season resort located slope side at Loon. We had a suite at the Mountain Club, which consisted of two rooms – a King Club Room and a Studio with Kitchen. The Studio with Kitchen had two Murphy beds, a bathroom, and a balcony that overlooked the outdoor pool. The King Club Room is a more traditional room with a King bed and a bathroom. 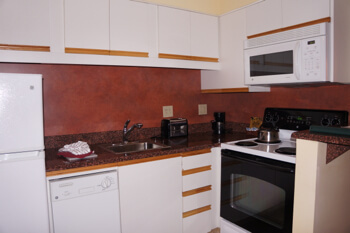 The two rooms can be separately locked if guests prefer to book only one, or can be opened together to create a suite. While the Studio with Kitchen would definitely accommodate our family of four, we definitely liked having the separate King room for when the kids went to bed early. The rooms aren’t luxurious, but are very nice. Following a large renovation last year, the Mountain Club rooms now include wider windows, better climate control, free WiFi, and brand new flat-screen televisions. 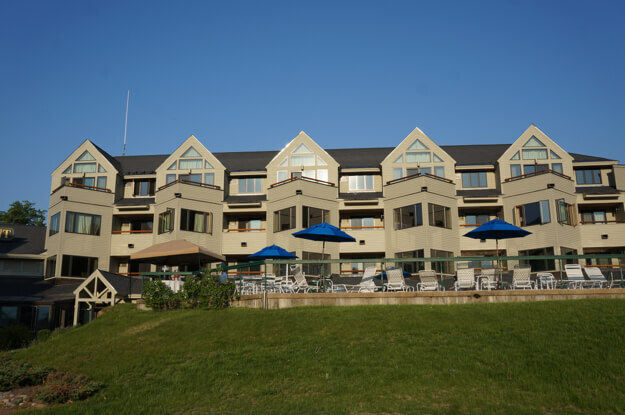 The Mountain Club at Loon offers a variety of amenities, including a full fitness center, indoor and outdoor pools, a spa, a lounge, a restaurant, and a gift shop. You are also just steps away from the Loon Mountain Resort, which offers skiing, ice skating, and snowboarding in the winter and mountain biking, hiking, and rock climbing in the winter. Learn more about the Mountain Club at Loon Mountain on their website.